Notes from a junior SCA armorial pursuivant. The original branch arms of Østgarðr were registered in 1979, and there were a couple of failed attempts to change them prior to passage of the current device in 1984. 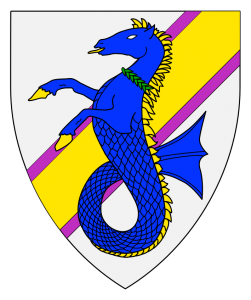 Per bend sinister purpure and Or, a seahorse rampant azure, crined, unguled and finned Or, orbed sable, gorged of a laurel wreath vert, grasping in its hooves a laurel wreath Or. 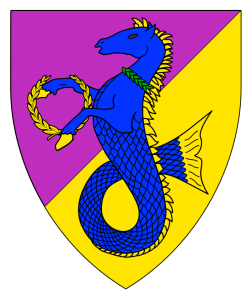 Originally submitted as “per bend sinister purpure and Or, a seahorse sejant azure, crined, finned, tailed and hoofed of the second, engorged of a laurel wreath proper,” during the 1979 “Heraldicon” effort to clear a two-year backlog of submissions the blazon was updated and the wreath being held in its hooves was added in order to satisfy the requirement for a prominent laurel wreath in each branch’s arms. These arms were not retained as a badge and were released in 1984 when the current device was registered. Argent, a bend sinister Or fimbriated purpure, overall a sea-horse erect azure, crined, unglued and langued Or, gorged of a laurel wreath vert. 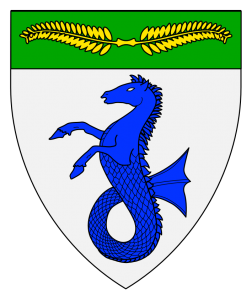 Argent, a seahorse erect azure, on a chief vert a laurel wreath elongated fesswise Or. This web site is not an official publication of the SCA.